From time immemorial, human beings have been reliant on several plants, roots and tubers mainly as a source of food and herbal remedy for tackling diseases. This has drawn them towards differentiating between the poisonous and the non-poisonous ones in other to identify the edible or non-edible ones. Moreover, roots and tubers are the major food crops especially in the tropical and subtropical region where they are used for human consumption and survival. One of these numerous roots and tubers that has gained popularity in human’s food crop is yam. Yam belongs to the family of Dioscoreaceae and the genus of Dioscorea. It is among the oldest tuber crop that contributes to food security and consumed either as a roasted, cooked or fried vegetable. Yam (Dioscorea) is a starchy, annual, herbaceous, climbing vine with tuberous roots. It is a monocotyledon that is originally from Africa, Asia and the Caribbean before spreading to other parts of the world. There are edible and non-edible yams and while the edible ones are for consumption purposes, the non-edible ones are used mainly for medicinal purposes. 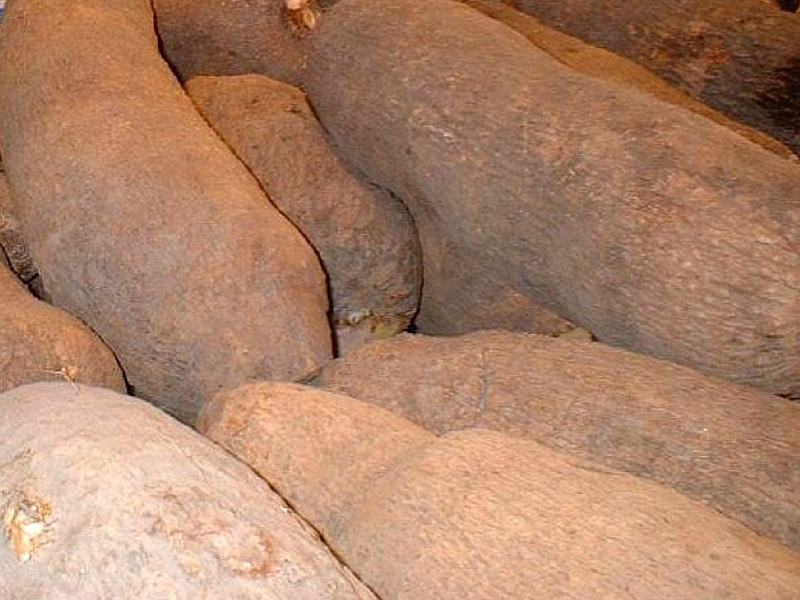 Being an annual crop, yam can be harvested and stored for usage throughout the year. It has over six hundred species dispersed all over the world especially in the tropical and subtropical regions, however, only a few species are considered edible. Yam is the second most essential root crop in West Africa after cassava (Manihot esculenta Crantz) and potatoes with Nigeria being the main producer. Due to the acrid nature of yam, the tubers contain toxic substances that can irritate and inflame the throat and buccal cavity if consumed raw. As a result, it is cooked before consumption to avoid any sort of gastrointestinal problems, such as diarrhoea and vomiting. Some species of yam include; Dioscorea togoensis, the Chinese yam (Dioscorea bulbifera), five-leaf yams (Dioscorea pentaphylla), yellow yam (Dioscorea cayenensis), aerial yam (Dioscorea bulbifera), Dioscorea dumetorum, Zanzibar yam (Dioscorea steriscus and Dioscorea sansibarensis), trifoliate yam (Dioscorea dumetorum), Dioscorea burkilliana, water yam (Dioscorea alata), Dioscorea praehensilis, Chinese yam (Dioscorea esculenta), white yam (Dioscorea rotundata), Dioscorea hirtiflora, Dioscorea bulbifera (bulbil and tuber), Dioscorea multiflora, water yam (Dioscorea alata). Dioscorea alata L. (Fam: Dioscoreaceae), which is locally known as kath aloo in Assam and popularly known as greater yam is a climbing perennial vines characterised by heart-shaped leaves. The tuber is edible and it makes a major staple food especially in Africa, Asia and South America. The main components of Dioscorea spp. are dioscin, dioscorin and saponins that are of great medicinal values. Yam is also a rich source of carbohydrate, energy (100% ), dietary fiber (16%), calcium (1%), vitamin C (28%), vitamin B-6 (15%), magnesium (5%), protein (3%), iron (2%), vitamin A (2%). Yam is also a rich source of riboflavin, ascorbic acid, phosphorous, ascorbic acid, thiamine, selenium, beta-carotene, zinc and niacin. Edible yams can be cooked, fried, boiled, roasted or pounded before eating. Yam can be processed into yam flour, which is used for making semolina or poundo. Poundo or semolina is often served with delicious soups such as oha soup, corchorus soup, bitter leaf soup , egusi soup and pounded yam etc. Roasted yams are also a popular street food in rural areas as well as fast food in urban areas in the African continent. Another means of preparing yam dish by Nigerians is to sun-dry parboiled yams, mill the pieces into a dry brown powder known as elubo or alibo. The elubo is then prepared by mixing and stirring in boiling water to form a thick brownish paste commonly known as amala. Amala is mostly consumed with ewedu soup or with ogbono soup. Purple yam is a rich source of anthocyanins that possess the anti-oxidizing abilities to slow down lipid peroxidation, prevent the attack of free radicals and minimizes the onset of cardiovascular diseases. Yam plays an important role in African culture especially the Igbos who celebrate the New Yam Festival. During this festival, yam is the main food served either roasted or served with palm oil, stew or sauce. Yam can also be prepared as yam and vegetable, tomato sauce with yam or served as yam porridge etc. Studies reveal that the Chinese people use certain species of yam as a herbal medicine for treating indigestion and intestinal colic. The high dietary fibre content of yam makes it capable of softening the stools thereby aiding easy eradication of waste products from the body. Yam can be used for alleviating diverticulitis, which is a health condition caused as a result of the inflammation of a diverticulum particularly in the colon, causing pain and poor bowel functioning. Studies reveal that yam can be used for soothing dysmenorrhoea, which is also known as painful menstruation that often involves abdominal cramps. Yam also helps to prevent ovarian and uterine pain. Studies reveal that wild, non-edible yams can be used for treating hypercholesterolaemia, which is a health condition caused as a result of the excessive amount of cholesterol in the bloodstream. Studies reveal that consuming Dioscorea bellophylla helps to reduce the blood cholesterol thus minimizing the onset of heart attacks. 1] Adeola, A. A., Otegbayo, B. O. and Ogunnoiki, S. (2012), Preliminary Studies on the Development and Evaluation of Instant Pounded Yam from Dioscorea alata. Journal of Applied Science and Environmental Management. 16 (3): pp. 287 – 289. 2] Bhandari, M.J. and Kawabata, J. 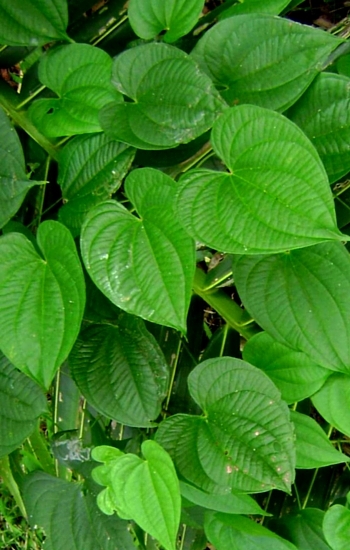 (2004), Organic acid, phenolic content and antioxidant activity of wild yam (Dioscorea spp.) tubers of Nepal. Food Chemistry 88: pp. 163-166. 3] Das A., Chaudhuri D., Mandal N. and Chatterjee A. (2012), Study of antioxidant and reactive oxygen species scavenging activity of the edible tuber of “greater yam” (Dioscorea alata L.) from North-east India. Asian Journal of Pharmaceutical and Clinical Research, 5(3), pp. 74–80. 4] Dutta, B. (2015), Food and medicinal values of certain species of Dioscorea with special reference to Assam, Journal of Pharmacognosy and Phytochemistry; 3(4): pp. 15-17. 5] Ekwu, F. C., Ozo, N. O. and Ikegwu O. J. (2005), Quality of Fufu flour from white yam varieties (Discorea spp.) Nigerian Food Journal. 23: pp. 107-111. 6] Ezeocha V. C. and Ojimelukwe P. C. (2012), The impact of cooking on the proximate composition and antinutritional factors of water yam (Dioscorea alata), Journal of Stored Products and Postharvest Research;3(13): pp. 172-174. 7] Gerardin O., C. Nindjin, Z. Farah, F. Escher, P. Stamp and D. Otokore (1998b), Effect of storage system and sprout removal on postharvest yam (Dioscores spp) fresh weight loss. Journal of Agricultural Science 130, pp. 329-333. 8] Girma G, Korie S, Dumet D, Franco J (2012), Improvement of accession distinctiveness as an added value to the global worth of the yam (Dioscorea spp) genebank Intl. J. Conser. Sci. 3(3): pp. 199-204. 9] Ketiku, A. O. and Oyenuga, V. A. (1973), Changes in the Carbohydrate constituents of yam tuber (Dioscorea rotunda Poir) during growth. J. Sci.ed.Agric. 24: pp. 25 – 28. 10] Morisawa, T. L. (1999), Weed notes—Dioscorea species: Dioscorea bulbifera, D. alata, D. sansibarensis,” in Control Methods—Plants, Global Invasive Species Team (GIST), Ed., The Nature Conservancy, Arlington, Va, USA. 11] Norman, P. E., Tongoona P., Danson J. and Shanahan P. E. (2012), Molecular characterization of some cultivated yam (Dioscorea spp.) genotypes in Sierra Leone using simple sequence repeats. International Journal of Agronomy Plant Productn. 3 (8): pp. 265-270. 12] O'Sullivan, J. N. and Ernest, J. (2007), Nutrient deficiencies in lesser yam (Dioscorea esculenta) characterized using constant-water table sand culture,” Journal of Plant Nutrition and Soil Science, vol. 170, no. 2, pp. 273–280. 13] Osunde, Z. D. (2008), Minimizing Postharvest Losses in Yam (Dioscorea spp. ): Treatments and Techniques, International Union of Food Science & Technology, pp. 1-4. 14] Rolland-Sabate A., Amani N. G., Dufour D., Guilois S. and Colonna P. (2003), Macromolecular characteristics of ten yam (Dioscorea spp) starches. J Sci Food Agri 83: pp. 927-934. 15] Sahore G. J. and N. A. Kamenan (2007), Changes in nutritional properties of yam (Dioscorea spp), green plantain (Musa spp) and cassava (Manihot esculenta) during storage, Food Science and Technology 47, pp. 81-86. 16] Schittenhelm, S., Sourell, H. and Löpmeier, F. J. (2006), Drought resistance of potato cultivars with contrasting canopy architecture,” The European Journal of Agronomy, vol. 24, no. 3, pp. 193–200. 17] Udensi E. A., Oselebe H. O. and Iweala O. O. (2008), The investigation of Chemical Composition and functional properties of water yam (Dioscorea alata): Effect of Varietal Differences. Parkistan Journal of Nutrition;7(2): pp. 342-343. 18] Wang, H., Cao, G. and Prior, R. L. (1997), Oxygen radical absorbing capacity of anthocyanins. Journal of Agricultural and Food Chemistry; 45: pp. 304–307.